I have a good 36 hours on the PC version of Warframe, so when I heard that Panic Button, who managed to successfully port both DOOM and Wolfenstein II: The New Colossus onto the switch, was porting Warframe as well, I just knew that I had to try it out. If there is one thing that I’ve learned about Panic Button Games over the past year, it is that they are masters of file compression, and are able to effortlessly fit graphically intensive games onto the not as capable hardware of the Switch without greatly compromising on visuals and framerate. For those who do not know, Warframe is a free-to-play third person shooter which puts you into the role of one of the Tenno, a faction of power-armored warriors that vigilantly defend the Solar System from alien and mutant threats with a variety of guns and melee weapons. They have their own class system, known as different Warframes, which all have their own powers and stats. It has been all the rage since it released and continues to gain traction every year with it’s promise of free DLC and updates, which the studio behind Warframe does not let down on. So onto the switch port. Warframe has always looked stunning, especially for a free-to-play game and became the new Planetside 2 after that had died down. The terrain and character models look amazing and the effects from firing your weapon, shooting your bow or launching a blast of frost power from your Frost Warframe look insane. Thankfully, Panic Button Games managed to successfully port the beauty of Warframe to the switch making too many compromises. From my experience, the game looked just as good as it did on my PC, albeit in 720p in handheld mode and back to full 1080p when docked. The graphical quality of Warframe running on the switch is on par with the look of the game on PS4 and Xbox One, which is a huge achievement. The cutscenes also look as beautiful and I cannot tell a difference between how it runs on PC vs. Switch. However, to have such a heavy game run on the switch, Panic Button games had to lower the framerate cap, and Warframe will not run at above 30 FPS on the switch, both in handheld and docked mode. Although this is a downscale it does not impact gameplay. The switch manages to keep a constant 30 fps, very rarely dipping which I haven’t experienced myself but have read about it online. Despite this, the game feels buttery smooth and looks pretty much as good as the PC version. Moving onto the controls, they are rather fiddly and can take time to get used to. Warframe has a lot of different movements and abilities which take a couple hours of gameplay to become fluent with but the controls on the switch started off being a bit annoying to me. I found it much harder to aim and I wish that there was some sort of aim-assist feature implemented like most shooters have when being played on any console. Apart from the aiming, the ability select is intuitive and the movement and combat controls are good. Unfortunately, the aiming issues still persists. The game can be run anytime, anywhere, provided that you have access to an internet connection. Another nifty feature is the ability to transfer your progress from a PC to Switch by signing in through your Warframe account; however, this is a one time duplication of the account and the two accounts will then operate as separate Warframe accounts. Unfortunately, you cannot transfer progress from the PS4 or Xbox One, but this cloning ability saved me another 36 hours of grinding. 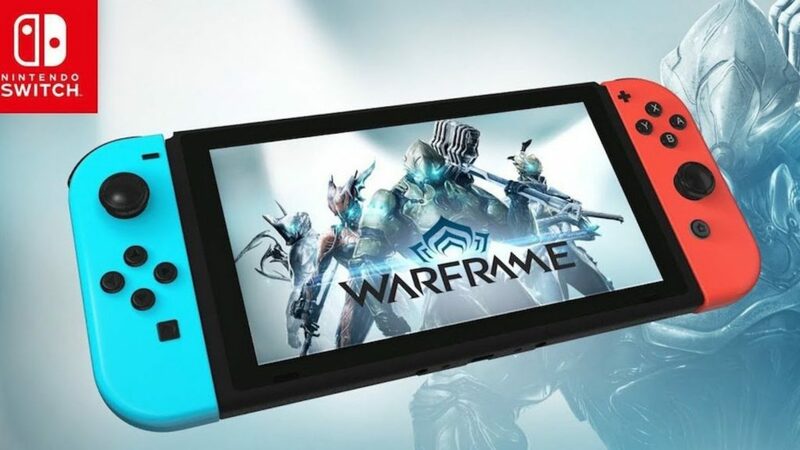 Another huge plus point is that Warframe can be played online with friends as it always has been, without the need to have a subscription to Nintendo Switch Online, so you don’t have to pay an annual subscription in order to play a free-to-play game. Isn’t that brilliant! Well, there it is, a review of Panic Buttons port of Warframe to the Switch. If you haven’t played Warframe yet and you own a switch, I highly recommend that you download the free game and give it shot, and if you don’t own a switch, download the game on your computer or any console and give it a play, I guarantee that you won’t regret it. If I had to give the game a score it would be A-Class and if I had to give the port itself a score it would be an S-Class port. Thanks for reading and check out my other reviews too! Plays Games, Watches Anime, Drinks Tea, Listens to J-Rock, Writes Code, Writes Novels and Reads A Lot. I love warframe but I don’t have a switch unfortunately. Anyone willing to donate one? Warframe is a good game.